Please be advised that if you do not have a credit card, the hotel will let you prepay the total amount of the room and a refundable deposit of € 50 per day per room. This deposit will be returned to you upon departure. All children up to 2 years old stay free of charge in a Double Room. Please note that if guests want to book breakfast after booking their reservation, breakfast will cost € 19.95 per person. Please inform Bilderberg Hotel Jan Luyken in advance of your expected arrival time. You can use the Special Requests box when booking, or contact the property directly with the contact details provided in your confirmation. Payment before arrival via bank transfer is required. The property will contact you after you book to provide instructions. This design room comes with an LCD-TV, a radio, a minibar, and tea/coffee making facilities. The private bathroom features a rain-shower, a toilet and a hairdryer. This room does not accommodate extra beds. This design room comes with a TV, a radio, a minibar, and tea/coffee making facilities. The private bathroom features a rain-shower or bath, a toilet and a hairdryer. This room cannot accommodate an extra bed. 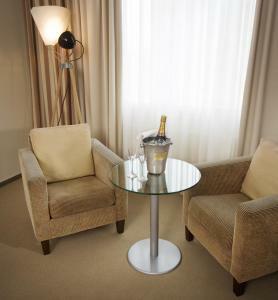 Large room with a separate seating area, ironing facilities, a coffee machine and Wi-Fi is included. The bathroom comes with a bath with shower, a toilet and a double washbasin, as well as quality toiletries and a hairdryer. This room can accommodate an extra bed upon request.